AV’s will Save How Much Money? What About a Human Controlled Cabin Commuter? How Could Autonomous Tech ever get that Cheap?!? But I’ll Never Give Up My Car!!! This is a chart that shows how much money autonomous vehicles may likely save Americans. It starts with taking the 254 million cars in America1 and removing the $8950 annually that we’re all paying2 to use them privately. Then we add back in the reduced amount of money that shared car users are will be paying3 to get a baseline expense number. Next we assume that autonomous vehicles will be at least 99% safer than human driven vehicles (Google’s fleet is already proving safer than that) and adjust for the $871 billion we’re currently paying for accidents in America.4 Finally we take out just a few of the major industries that rely on private car ownership like the aftermarket,5 parking,6 car care7 and car rental8 industries that Americans are currently paying for. And that’s just the hard costs. If we also put a value on the 75 billion hours America spends behind the wheel9 every year, and I’ll value that time at the US national average wage of $42,70010 and we assume a 2000 hour work year then that means that time is worth 1.6 trillion dollars. 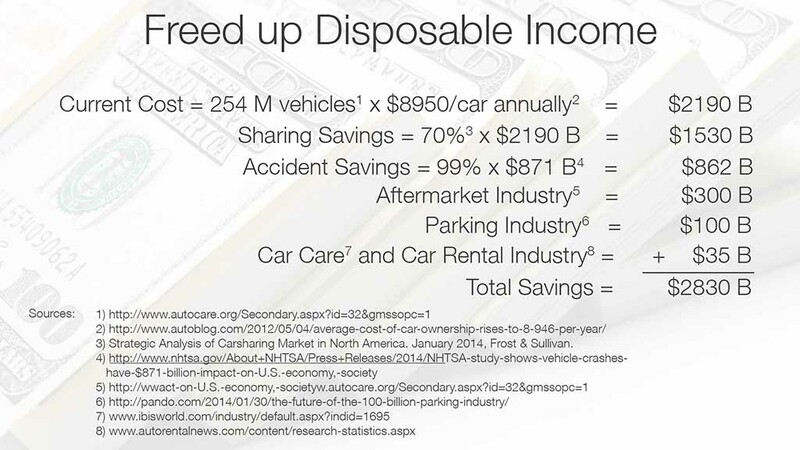 So the total savings from autonomous vehicles come to about $4.43 trillion dollars. Every twelve months. I'm a lifelong car addict, science nerd, sci-fi geek, and general automotive and everything mechanical enthusiast. I have twenty years of experience as a graphic & industrial designer, project manager and business owner & founder. I am also an entrepreneur who grew two businesses from start up to over $5M in value through superior organizational skills, effective personnel management and original creative thinking.